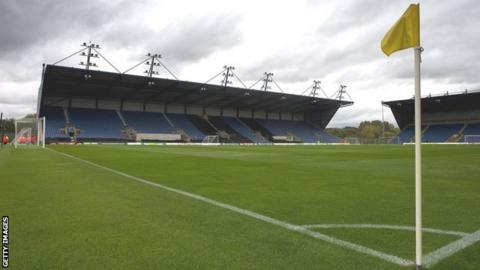 Premiership promotion hopefuls London Welsh say they hope to play their home games at Oxford United's Kassam Stadium next season if they go up. The Exiles will learn next week if their application to join English rugby's top flight has been approved. If it has, then victory over the Cornish Pirates in a two-legged final, will see London Welsh promoted. "We are very excited about the prospect," London Welsh chairman Bleddyn Phillips told BBC Radio Oxford. The Championship club travel to Penzance on 23 May for the first leg of their play-off and then host the Pirates the following Wednesday - at the Kassam Stadium. Welsh stated last week that they would move their home games away from Old Deer Park in Richmond if promoted because it is too small to meet the Premiership's minimum capacity standard of 10,000. A number of venues had been mooted as solutions but the Kassam Stadium, which can hold 12,500, has now emerged as the favourite. "We've had positive discussions with the owners of the Kassam Stadium and Oxford United," added Phillips. "There is an audit process ongoing by the RFU and we hope the Kass meets their criteria. "We haven't heard anything to the contrary but we are hopeful all the boxes have been ticked and we can take our place in the Premiership - providing we beat the Cornish Pirates. "We have other options but we are very seriously looking at the Kassam." Phillips believes the move could be mutually beneficial for both clubs, although the owner of the ground Firoz Kassam would also need to approve the move. Welsh would not be the first Premiership side to ground share with a football club nor would they be the first traditionally London-based outfit to take tenancy outside the capital's boundaries. Premiership Champions Saracens, London Irish and Wasps have all moved their home fixtures to football grounds away from London in order to try expand their businesses and fan bases. "It is a great opportunity to bring top-flight rugby to Oxford, and another top-flight sport to the community," Phillips continued. "But we won't forget our fan base in south west London and will make sure they can get there. "I've had direct conversations with [Oxford United chairman] Kelvin Thomas that have been very constructive. "Clearly from the football club's point of view we would be able to share costs and build links in the community."